Looking to bring your disc printing work in house? 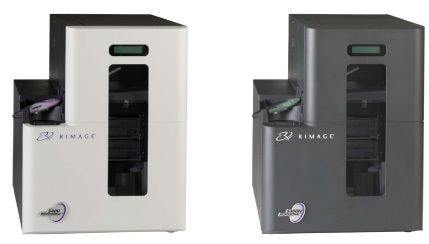 The Rimage Professional Series 3400 and 5400N disc publishers, with 150-disc capacity and two front swappable recorders, are the ideal solution for any small business. While Rimage has made a name for itself in reliability and durability, the introduction earlier this year of the Professional 3400 shook up the competition in design, print technology, and versatility. An Everest retransfer thermal printer, the Rimage 3400 creates permanently fused, waterproof and scratchproof 400 dpi disc designs that have the look and feel of professional quality. With three 50-disc trays, the printer can handle speeds of 60 seconds or less at the equivalent of 400 pixels per inch and recording for CDs., DVDs, or Blu-ray discs or a dual combination. Disc creation becomes as easy as printing to an in-office printer with this new professional yet compact series. The 3400 truly is a solution for everyone; Mac and PC users alike can access software, DiscFlow and QuickDisc respectively. And Rimage offers the carousel rotating disc bin with the 3400 – the first of its kind at this price point. The 5400N, while offering nearly the same specifications as the 3400 with the exception of an embedded PC control center, is a game changer. When it comes to quality, speed, and cost-per-disc, the 5400N outshines all its counterparts. The 5400N is a networked disc publishing solution that is as easy to use as a networked printer or copier. Simply connect the Ethernet cable into the back of the embedded computer and the 5400N is connected to the network. When using a 5400NN, users have full access to all Rimage Producer Software Suite features. Chris Wells, vice president of marketing and strategy at Rimage, said there’s relatively no competition in the marketplace to these two products. “This product opens a new market segment by providing an easy to use, reliable, high quality, full capability, permanent printing solution without the compromises of inkjet print technologies,” Wells said. Contact a Gotmedia Sales Rep for more information at 866-409-1090. The folks at Microboards are offering a rare instant rebate deal on some of their top-of-the line publishers and printers. Whether you’re in the market for your first professional series equipment, need to add additional bandwidth to your existing stock, or need to upgrade, now may be a great time to buy. 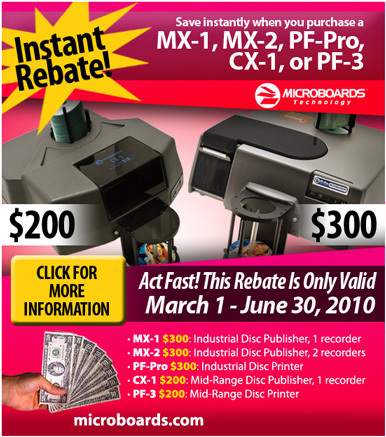 Customers who buy a CX-1 Disc Publisher or PF-3 Disc Printer from Microboards between Monday, March 1 and Wednesday, June 30 will receive an instant $200 rebate. Go for the MX-1 or MX-2 Disc Publisher or PF-Pro Disc Printer and you can receive an instant $300 rebate. The CX-1 Publisher with a 100-disc printing and publishing capacity usually runs about $2,100 and has been considered one of the faster machines on the market, whereas the PF-3 Disc Printer, also a 100-disc capacity, can start as low as $1,600. The CX-1 is versatile in that it can handle CDs, DVDs, and Blu-ray discs, but for a streamlined version, the PF-3 will handle just your printing jobs with high-quality HP resolution. The MX-1 Publisher typically runs between $2,400 and $2,800 and the MX-3 can cost from $2,600 to $2,800. The Microboards MX series publishers are known for their low cost-per-print ratio, averaging about 11 cents per print, and are ideal for publishers with high volume. The PF-Pro, ranging from about $2,200 to $2,400 is the printer-only version of the MX series for customers who need specific functionality. Aaron Pratt, the director of marketing for Microboards, says these rebates are a “tremendous opportunity” for all Microboards customers. He reminds everyone that these rebates are instant, so there’s no need to mail in any proof of purchases or receipts. Today CDs can store up to about 700 MB of data while DVDs max out at around 4.7 GB, but media storage capacities are constantly trending upward, particularly with the rise in popularity overburn and dual-layer techniques. Duplication and replication. The words may sound remarkable similar, but the differences between the two are important to point out. To make the most appropriate choice you want to make sure you know the difference when choosing the appropriate software and technology combo or professional organization for your next project. Duplication is often also referred to as CD burning. Whereas a single copy involves transferring from data one CD or DVD to another, the term duplication is used when referring to a media copy job that involves more than just one copy being made. Duplication jobs of about 1,000 discs or less can often completed at home or in-house with the use of a dedicated computer (or computers) with multiple burners or with a professional CD DVD duplicator. The technology used in duplication is called laser etching, which transfers the data from one disc to another – a portable, convenient, and economical form of data transfer. Instead of making a copy of data, replication essentially makes a clone of the original data. In replication, a glass master is created from the original version of the CD or DVD and then a mold (or set of molds), sometimes referred to as stampers, is created from that glass master. The process of replication allows for every disc to be a first-generation replica. The stampers act as a blueprint; they are used with high-injection molding to make a plastic disc-like molded clone. The clone is covered with a thin layer of aluminum and sealed with a layer of laquer, which is hardened by ultraviolet light. Because of its technical nature, replication is typically used for large-scale jobs of 1,000 or more (the larger the quantity, the lower the cost) and is usually completed by a disc replication company. Replication services offered by these companies often include printing and packaging services as well, and the quality of the replicated discs is often higher than duplicated discs. The difference in price can be substantial: a job of 300 discs may cost about $2 disc, whereas a job of 1,000 can drop to about $0.50 per disc. The bulk of the additional costs for replication come from the set up fees. Standout feature Unattended operation and reduced vibration during printing Tuffcoat and watershield technology and robotics disc transfer with a stepper motor instead of a lead screw Robotics technology and embedded processor/hard drive for storing jobs Data-streaming technology smoothly transmits data to recorder to cut down on down time.